I was so excited to see that Marisa from Food in Jars is holding a year long preservation challenge. The Food in Jars Mastery Challenge is a year long, skilled-based challenge. Each month focuses on a different aspect/ skill set of preservation. I was so excited to see that January was marmalade. I've made my fair share of jam and pickles, but I've never tried marmalade. I've always been intrigued by marmalade, but it was something we really didn't having growing up. I can't even remember the last time I had marmalade or what it even tasted like. In the Mastery Challenge Facebook Group, there has been lots of talk about the bitterness of marmalade. 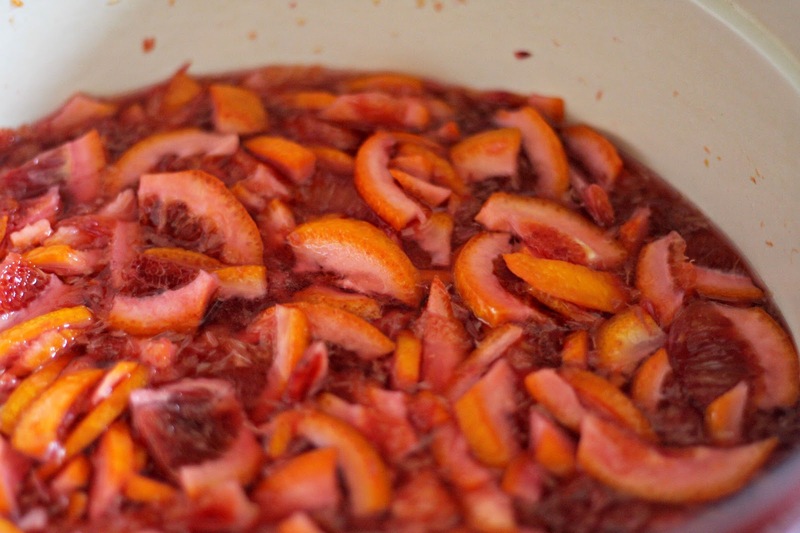 I wasn't really sure where I stood, so I choose to make the most bitter kind of marmalade that uses the whole fruit. 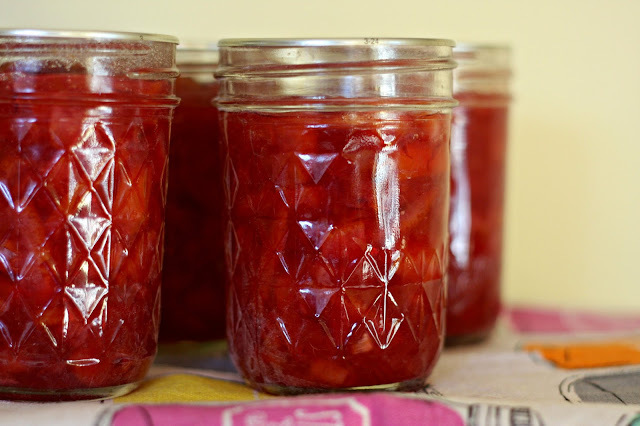 I choose the whole fruit method, as I was intrigued by creating a bitter preserve and also because the cut rind method would require slicing away the zest, which I don't quite have the proper tools for. Turns out, I don't mind the bitterness. I used Marisa's Blood Orange Marmalade recipe and was very happy with the result. It took quite a while for it to set, but with patience I have a looser set that pleases me. I added some pectin which helped it set a bit better. I also loved that I spilt this recipe up between two days, which made the process feel less time intensive. Day 1: Cut and core the oranges. Pull out any seeds you find (tip: some blood oranges don't have seeds, so don't worry if you don't find any!) Place cores and seeds inside cheesecloth, closed tight so they cannot escape. Slice oranges into small strips. Place oranges in a bowl with three cups of water. Submerge bag of seeds and cores within the water. Cover with plastic wrap and let soften in the fridge overnight. Day 2: The next morning, mix oranges and water with 2 1/2 cups of sugar in a large non-reactive pot. Bring to a simmer and let reduce by half. Using a thermometer, bring mixture to 220 degrees. When finished cooking, ladle marmalade into prepared jars. Wipe jars clean, put on lids and rings, and process for 10 minutes. Let cool at room temperature for 24 hours. Hi! I'm Lily, a 20-something living outside Boston. I'm a lover of all baked goods, adventuring in the kitchen, all things striped, and my husband-to-be and demonic (but adorable!) cat. Welcome to my blog chronicling my kitchen adventures and beyond.